› Author AffiliationsThis work was supported by the Regione Toscana under POR-CREO 2014-2020 (project ‘COOLSUN’), the Università di Pisa under PRA 2017 (project No. PRA_2017_28). An efficient synthesis of symmetrical 1,2-disubstituted 4,5-dialkynylimidazoles by Sonogashira alkynylation of the corresponding 4,5-dibromo derivatives was developed. Moreover, through a careful tuning of the palladium ligand, unsymmetrical 1,2-disusbtituted 4,5-dialkynylimidazoles were also prepared through a regioselective C5 alkynylation of 4,5-dibromoimidazoles, followed by a second alkynylation involving the 4-bromo derivatives so obtained. 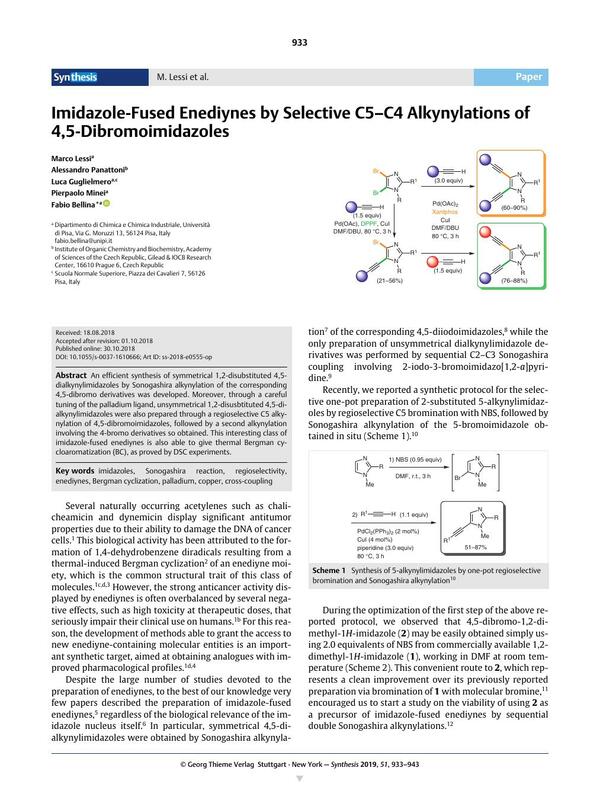 This interesting class of imidazole-fused enediynes is also able to give thermal Bergman cycloaromatization (BC), as proved by DSC experiments. Supporting information (Table S1, copies of NMR spectra for compounds 4a–e, 5a–e, 9a–d, 10a, and DSC thermograms for compounds 5a–d and 9a–c) for this article is available online at https://doi.org/10.1055/s-0037-1610666.